Cor triatriatum dexter (CTD) is a very rare cardiac anomaly in which a membrane divides the right atrium (RA) into two chambers. Clinical presentation of CTD is slightly variable. Most patients are asymptomatic, and a lesion is discovered during echocardiography or surgery for other cardiac lesions. When accompanied with interatrial defects, patients with CTD exhibit cyanosis because of the right-to-left shunt via interatrial communication. Moreover, CTD and cyanotic congenital heart diseases require differentiation. To our knowledge, there are no reports of infants with a hypoplastic RV who were diagnosed with CTD, and there is no consistent opinion about the best treatment strategy for CTD. Here, we describe a male neonate with CTD and a hypoplastic RV having symptoms of central cyanosis soon after birth. A large membranous structure was identified in the RA and flow from the inferior vena cava was partially redirected into the left atrium (LA) via the patent foramen ovale (FO). We surgically resected a large membranous structure from the RA and partially closed the FO when the patient was 4 months old. We performed cardiac catheterization 12 months after surgery and confirmed that the RV was well-developed and had good function. We speculate that for CTD with hypoplastic RV and inter-atrial communication, resection of the Eustachian valve and partial closure of the FO may be effective treatment strategies as long as the size of the RV is considered. Further studies on RV size and intervention for the FO in such cases of CTD are needed. Cor triatriatum dexter (CTD) is an extremely rare congenital cardiac malformation in which a persistent embryonic right sinus venosus valve subdivides the right atrium (RA). To our knowledge, there have not been any reports of infants with a hypoplastic RV who were diagnosed with CTD, and there is no consistent opinion about the best treatment strategy for this condition. In this case report, we describe a male neonate with CTD and a hypoplastic RV who had symptoms of central cyanosis soon after birth. In this patient, a large membranous structure was identified in the RA and flow from the IVC was partially redirected into the LA via the patent foramen ovale (PFO). The guardians of the patient, whose details appear in this report, provided verbal informed consent, and the study’s design was approved by the appropriate ethics review board. A male neonate was spontaneously born at 40 weeks of gestation after an uncomplicated pregnancy, and his birth weight was 3,310 g. His Apgar score was 9 and 10 at 1 and 5 min, respectively. At 3 hours after birth, his physical examination revealed the presence of central cyanosis with a room air oxygen saturation value between 85% and 93%. The patient was unresponsive to oxygen administration, and the room air oxygen saturation level decreased to below low 70% with crying. The patient was otherwise well, with no signs of respiratory distress. Transthoracic echocardiography was performed at an outside hospital and showed tricuspid valve stenosis and closing ductus arteriosus. A prostaglandin E1 infusion was started and the neonate was transferred to our institution. Upon admission, his saturation values remained around 85%–90%, although he had patency and an adequate ductal size. His vital signs, except for oxygen desaturation, were within normal range. His cardiovascular examination showed a quiet precordium, normal heart sounds, and no murmur. The results of all investigations including complete blood count, septic work-up, and liver and renal function tests were normal, but only the plasma brain natriuretic peptide level was elevated to 131 pg/mL. The venous blood gas pH was 7.45 and the PaCO2 was 35.8 mmHg, and the base excess was +1.7 mmol/l. The findings of chest radiography and electrocardiography were also unremarkable. Using two-dimensional transthoracic echocardiography, we diagnosed the neonate with congenital tricuspid valve stenosis with a hypoplastic RV at first (Fig. 1A–C) and continued administering prostaglandin E1 infusion. The tricuspid valve was hypoplastic and dysplastic with trivial tricuspid regurgitation (the annulus measured 6.0 mm; the normal range is 9.3–17.5 mm; z-value, −3.9). The inflow of the tricuspid valve appeared to be substantially narrowed with an eccentric jet crossing from the RA to the hypoplastic RV. A pulse-wave Doppler ultrasound examination of the tricuspid valve’s inflow revealed it had a monophasic pattern with maximal velocities of 1.4 m/s. The pulmonary valve’s annulus was smaller (6.6 mm; the normal range is 5.9–9.8 mm; Z-value −0.93), but there was no evidence of abnormal valve thickening or flow acceleration and valve regurgitation on color or pulsed Doppler ultrasound examinations. Fig. 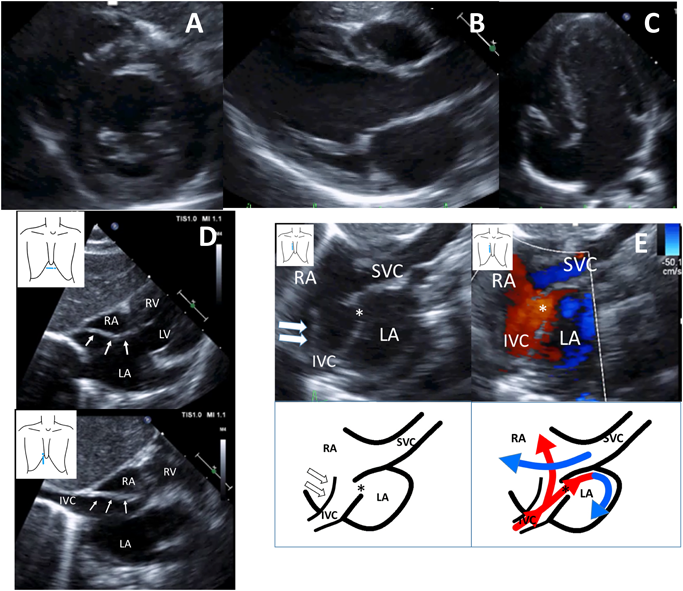 1 LV short axis (A), LV long axis (B), and apical four chamber (C) two-dimensional echocardiography views showing a hypoplastic RV and the tricuspid valve diameter (6.0 mm, Z value −3.9) after birth (D) Subxiphoid coronal and sagittal two-dimensional echocardiography views showing a linear membranous structure projecting into the RA arising from the junction of the IVC. (E)Right sternal border sagittal two-dimensional echocardiography view showing a linear membranous structure projecting into the RA and PFO, and anterior deviation of the atrial secondum septum. Color Doppler image showing a linear membranous structure that hemodynamically divided the RA into two chambers. The flow from the IVC was partially redirected into the LA via the PFO and flow from the SVC mainly drained into the RA. A few days later, we noticed there was a prominent and elongated membranous structure extending from the junction of the IVC to the RA (Fig. 1D). Color Doppler ultrasound with a right sternal border sagittal view showed that the large membranous structure hemodynamically divided the RA into two chambers; that is, both blood flow from the IVC and superior vena cava (SVC) were partially redirected by this membrane to the LA via the PFO, leading us to diagnose the patient with CTD (Fig. 1E). After stopping prostaglandin E1 infusion, we confirmed that the ductus arteriosus was closed, and the patient’s saturation values remained at approximately 85%–93% with oxygen inhalation (1 L/min nasal cannula). Upon serial evaluation with transthoracic echocardiography, we found that the tricuspid and pulmonary valve diameters gradually grew in the postnatal period (Table 1). We judged that elective surgery was possible, and the patient was sent home with standby oxygen and a pulse oximeter at 33 days after birth. Since desaturation progressed, we performed cardiac catheterization when the patient was 3 months old. Angiography of the SVC showed that contrast media mainly flowed toward the tricuspid valve into the RV (Fig. 2A). Similar to the echocardiographic findings, the tricuspid valve’s diameter and RV volume were small (Fig. 2B, C). We performed a balloon occlusion test of the foramen ovale (FO) and compared the hemodynamic parameters and angiographic findings before and after the balloon occlusion test (Table 2). Considering the end-diastolic volume of the RV (RVEDV) and tricuspid valve’s diameter, we judged that partial closure of the FO was more preferable than total closure. Fig. 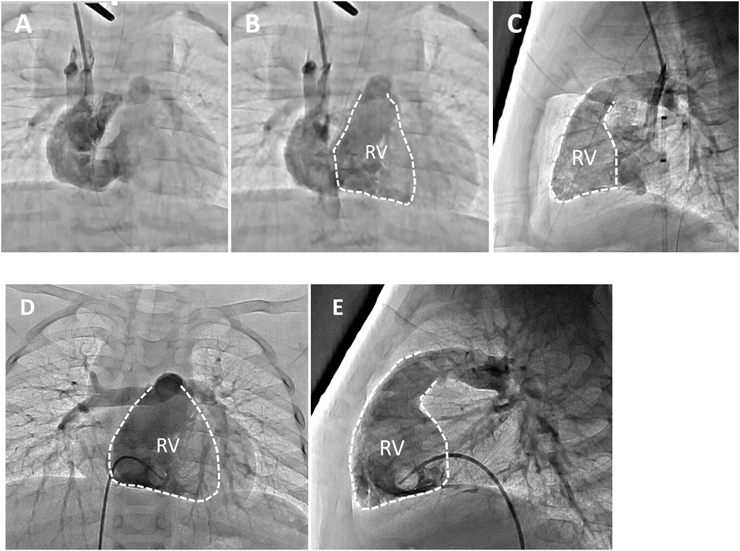 2 Preoperative angiography of the SVC (A, B: frontal view, C: lateral view) showing that contrast media mainly flowed into the RV through the tricuspid valve. The tricuspid valve’s diameter and RV volume were small. (RVEDV 9.2 mL, 50% of normal, EF 54%,PA index 127) Postoperative angiography of the RV (D: frontal view, E: lateral view) showing that the RV volume had developed. We performed surgery (resection of the large persistent right sinus venosus valve and partial closure of the PFO) when the patient was 4 months old and had a body weight of 9.1 kg. We performed cardiopulmonary bypass with cardioplegic arrest. The large membrane that originated from the crista terminalis and Eustachian valve covered half of the caudalis of the FO, and we completely resected it by separating its attachment (Fig. 3). The tricuspid valve’s diameter was 11 mm (61% of the normal diameter) and had a dysplastic appearance, and the PFO was approximately 6 mm. We finally decided to close the FO partially, and we sewed only the right border of the FO and reefed it to 4 mm. The neonate’s postoperative course was uneventful. An echocardiogram showed that he had normal cardiac function, the large membranous structure in the RA had disappeared, and flow from the IVC was mainly directed into the tricuspid valve with a small right-to-left shunt through the partially closed FO. The patient was transferred to the general ward of our hospital on the second day postoperatively and was discharged on the 12th postoperative day. After surgery, his room air saturation level remained around 90%, and it increased to 95%–97% with the administration of oxygen, so he was sent home with standby oxygen. The patient’s room air saturation values increased and remained around 94% beginning 3 months after surgery and remained at around 95%–96% beginning 6 months after surgery; therefore, we administered home oxygen therapy 7 months after surgery (Table 3). We performed cardiac catheterization 12 months after surgery and confirmed that the RV was well-developed and had good function (Fig. 2D, E). We expected that the PFO would close spontaneously during the follow-up period. In this case report, we described a male neonate with CTD with a hypoplastic RV who had symptoms of central cyanosis soon after birth. A large membranous structure was identified in the RA and flow from the IVC was partially redirected into the LA via the PFO. We surgically resected the large membranous structure and partially closed the FO when the patient was 4 months old and the patient had a good clinical course. The clinical presentation of patients with CTD is slightly variable. Most patients are asymptomatic, and a lesion is discovered during echocardiography or surgery to correct other cardiac lesions. Cyanosis may occur in those with associated interatrial communication due to a large right-to-left shunt when flow from the IVC is redirected into the LA via interatrial communication. Our patient had cyanosis soon after birth. We believe that the membranous structure in the RA was large enough, and anterior deviation of the atrial secundum septum permitted blood flow to be redirected from the IVC into LA. This right-to-left shunt across the PFO explains why basal desaturation was unresponsive to oxygen. The left valve of the sinus venosus retrogressed and was absorbed into the limbus region of the septum secundum. It is thought that abnormal development and absorption of the left valve of the sinus venous are related to anterior deviation of the septum secundum. When accompanied with interatrial communication, a right-to-left shunt may be observed, and the patient may be misdiagnosed with a tricuspid valve anomaly. In our case, we misdiagnosed the patient as having congenital tricuspid stenosis at first. Congenital tricuspid stenosis is usually associated with other anomalies, especially RV tract obstruction or atresia with secondary hypoplasia of the RV. Clinically, tricuspid valvular stenosis can be distinguished from hypoplasia of the tricuspid valve. 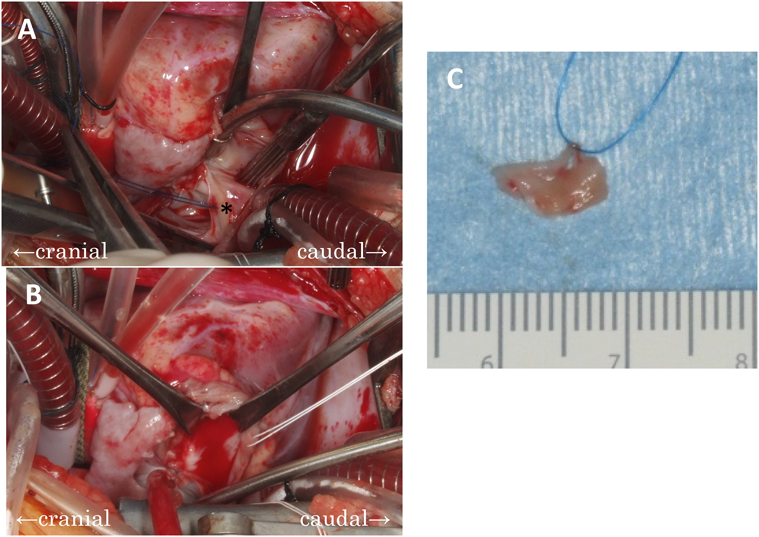 In patients with tricuspid valvar stenosis, the tricuspid annulus may be relatively large, but its leaflets are thickened with commissural fusion and shortened chordae tendineae. In those with hypoplasia of the tricuspid valve, the tricuspid valve’s annulus is small, and its leaflets and chordae may be diminutive but otherwise normal. Our patient had a small tricuspid valve diameter; thus, we should have diagnosed him with hypoplasia of the tricuspid valve rather than congenital tricuspid valve stenosis, but the RV outflow tract was intact. In a patient with a small tricuspid valve diameter and without RV outflow tract obstruction or atresia, it is important to detect the RA by considering the possibility of a persistent right sinus venosus valve. In this case, we observed the neonate for 3 months considering the following points: permissible range of hypoxemia on oxygen supply; serial development of tricuspid valve diameter; and the possibility of spontaneous regression of Eustachian valve. We initially wanted to observe the patient’s natural improvement, but natural improvement was not observed. Due to progressive desaturation, small RV volume by angiography, and necessity for resection of the Eustachian valve and also intervention for the PFO, we deemed surgical intervention to be necessary. In our case, whether we could totally close the FO or not was an important clinical point because of the small RV volume. As there are no reports similar to our case, we extrapolated the RV-TV (tricuspid valve) index used in the operative method selection criteria for pulmonary atresia with intact ventricular septum. The RV-TV index was 0.29 in our case (RVEDV 50%N, tricuspid valve diameter: 58% of normal), and we believe that this indicated partial closure of the FO (4-mm fenestration). As a result, cyanosis remained after the surgical operation, but it gradually improved as the right ventricle grew. If we had performed total closure of the FO, we believe that the patient would have been more likely to suffer from right heart failure, although there was a possibility of earlier right ventricular development. We speculate that for CTD with hypoplastic RV and inter-atrial communication, resection of the Eustachian valve, and partial closure of the FO may be effective treatment strategies as long as the size of the RV is taken into consideration. Further studies on the RV size and intervention for the FO in such cases of CTD are needed. We would like to thank Editage (www.editage.jp) for English-language editing.